Following on from the success of their first collaboration, Epiphone have teamed up once again with Bjorn Gelotte of In Flames to produce another exhilarating guitar. The Epiphone Limited Edition Bjorn Gelotte "Jotun" Les Paul Custom Outfit is inspired by the classic track co-written by Gelotte, the "Jotun" is a work of art - breathtakingly beautiful, supremely powerful. As with their previous effort, Epiphone have gone to exceptional lengths to produce a model that is fit for purpose, and the "Jotun" is Gelotte's go to guitar on stage. If it is good enough for the man himself, then what more could you ask for? A bottle opener you say? As it happens, as per Gelotte's request, Epiphone have even included one of them too. We'll skip the intro about Gelotte and In Flames, suffice it to say, the man knows what he wants from a guitar, and Epiphone have once again smashed expectations. 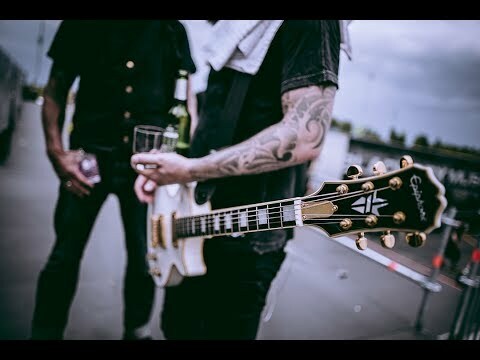 The Bjorn Gelotte "Jotun" Les Paul Custom Outfit is crafted from solid, unchambered mahogany to establish a warm and enduring tonal foundation, as well as that classic Les Paul "feel". Finished in an angelic bone white paintjob, the body has been treated to traditional Les Paul style cream and black 5-layer binding. To ensure rigid stability, the glued, set-in mahogany neck is shaped to Gelotte's preferred rounded, custom '59 profile that responds well to a firm hold. Married to the neck is a sublime 22-fret ebony fingerboard with medium-jumbo sized frets. Single-ply cream binding has been applied to guarantee smooth transitions between frets, whilst the 12-inch radius is perfect for executing the smoothest of string bends. The adjustable truss rod enables you to adjust the neck position to suit your playing style, and as one of the intricate finishing touches, the truss rod cover features Bjorn's signature. The pickup compliment in this model comprises a pair of EMG USA "Metalworks" 81 and 85 active humbuckers - fitted in the neck and bridge positions respectively. The 81 offers blistering lead tones with a razor-sharp attack and awesome sustain, allowing you to wail and squeal to your heart's content. The 85 offers greater emphasis on a mid to low-end tonal output, making it excellent for chugging riffs and focused rhythm tones with plenty of beefy mids. Each pickup has an individual volume and tone knob, whilst a three-way pickup selector allows you to select either or both pickups - a simple control setup that can be used to create a huge range of sonic possibilities. Just don't forget that as they're active humbuckers, a 9-volt battery is required to keep them powered up. In keeping with the hardware finish, both pickups have smooth gold covers. To match the solid construction and sublime tonal offerings, Epiphone have installed gold Grover Roto-matics with a super-strong 18:1 gear ratio - perfect for upholding drop-tunings with thicker string gauges, etc. Fitted to the body is a LockTone "Nashville-style" Tune-o-matic bridge with stopbar tailpiece, a partnership that provides a seamless connection between the strings and body to optimises intonation and sustain. Everything about this guitar feels reassuringly solid, allowing you to get on with playing as hard as you like, safe in the knowledge that the guitar can keep up with you every step of the way. As well as the truss rod cover signature, Epiphone have included tasteful appointments that make this model just a little more special. The headstock features the Epiphone logo in pearloid, with the In Flames "Jester" inlay, also in pearloid. The headstock reverse features the "Epiphone Limited Edition" logo in gold. Each model is supplied with a custom hard case with the "B.I.G" logo in gold with user manual. There is a certificate of authenticity, which is hand-signed by the man himself in a special binder with photograph, and Epiphone's limited lifetime warranty.